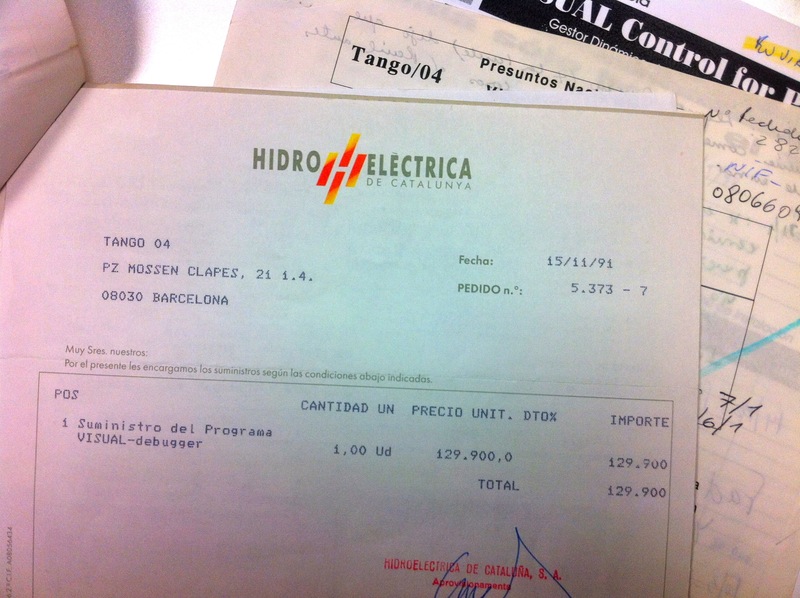 On November 15th, 1991, we received the first order for a software product developed by Tango/04 Computing Group. The local electricity company, Hidroelectrica de Catalunya, was keen on going forward with VISUAL debugger, which I had been coding alone during most of that summer. I’ve just seen the date trying to rescue the large bins full of old invoices from destruction. It’s good to see those familiar pages again. I’ve also noticed that we had sent a couple of faxes to Antonio Ariño, our first customer (thanks for the confidence, Sir! ), with information on completely unrelated matters that he was interested in. Hey, we were always trying to add value. 20 years and two days from the first order, and I have nothing but appreciation for all the people that made Tango/04: teammates, ex-teammates, customers, partners, suppliers, fans, everybody. Thanks and congratulations to you all.